We first visited the fabulous town of San Sebastian in 2010 to watch the Clasica San Sebastian and have been visiting regularly ever since. Sometimes it’s hard to articulate why I like the place so much. But, in short, it’s all about the city’s Belle Epoque architecture, its beautiful sandy beaches, Basque culture, Basque cuisine and overall ambience. When friends ask me for recommendations for a week-end away, I never hesitate to mention San Sebastian. Its appeal is evergreen, just like the surrounding hills. It helps that San Sebastian is cradled in a perfectly shaped bay and boasts four beautiful sandy beaches right on its doorstep. It’s a global gastronomic giant, with more Michelin stars per capita than anywhere else in Europe – yes, even Paris! There are plenty of festivals throughout the year and last year (2016) it was the European City of Culture. San Sebastian has an interesting history. The city was largely destroyed by fire in 1813 by the British and Portuguese. The tragedy left just one street standing, now renamed after the deadly assault, 31 de Agosto, and home to some fabulous eateries. The place was gradually rebuilt from scratch, albeit initially still within the confines of the city walls. Thereafter, the previously compact town began to spread along La Concha beach. In 1854 it took over as the regional capital of Gipuzkoa from Tolosa and continued its inland expansion, demolishing the old city walls in the process, part of which can still be seen in the underground car park on Boulevard. It’s a place that’s easy to walk around so come with me for a gentle stroll. If we look at the city from left to right, Monte Igeldo towers above the western end of Ondarreta beach. Access its summit via a quaint funicular railway that runs up its eastern flank. Can I suggest you ride up and walk down. It’s worth it alone for the views from the top. Ignore the hotel and fun fair at the summit, instead stop for a delightful lunch at Rekondo on your way back into San Sebastian – more stunning views, fabulous menu and an amazing wine cellar. While you’re walking off lunch. Walk round the headland to see Pieno del Viento, one of Basque sculptor Eduardo Chillida’s most well-known works at the western end of Ondarreta beach. Three steel sculptures are twisted into shapes designed to comb the prevailing wind. The one facing the rocks represents the past, the one looking out to sea is the future and the one you can touch is the present. As you stroll back into town, you’ll pass by the Miramar Palace on your right which marks the divide between the two beaches. It’s the former site of El Antiguo Monastery which was pretty much all there was in San Sebastian back in the 12th century. On the left you’ll see La Perla, re-built in 1912, the white Victorian edifice which now houses a Thalassotherapy Centre and several bars and restaurants. At the eastern end of La Concha beach, you’ll see the fishing port lined with restaurants, fishermen’s cottages, and now home to the Aquarium. On the way over, you’ll pass by the Yacht Club which forms part of the sea wall. It looks like a ship and is a stark contrast to its surrounding buildings. It’s not far from the Town Hall or Ayuntamiento, completed in 1887 and originally built as a casino but the 1924 prohibition on gambling rather thwarted its original purpose. Out front is the Alderdi-Eder park designed by the same gardener who designed the gardens of Versailles. The non-native stumpy tamarind trees were a present from Napoleon III to the city and burst into purple flowers during August, a sight to behold. On the opposite side of the Town Hall, you’ll see El Dual, a hole studded sculpture which commemorates San Sebastian’s victims of the Spanish Civil war. Behind it you’ll see the fisherman’s church, Capilla de San Pedro Apostol. Presiding above the fishing port is Monte Urgull which sports a ruined castle, the English cemetery for soldiers who perished in the Carlist wars and another emblematic sculpture, the Sagrado Corazon (sacred heart). Now, turn right and head into the Old Town past the beautiful Inglesia de Santa Maria. It’s the third church on this site and, aside from the beautifully sculpted stone, is notable for the ship’s emblem and crown that adorn its top. Look down the street and you’ll see the spire of the Catedral Buen Pastor which can hold up to 4,000 and has a gi-normous organ. The cathedral sits at the end of the Plaza Buen Pastor, in front of a simply splendid main post office and the Koldo Mitxelena Cultural Centre. As you wander along the famous 31 de Agosto road, do find time for some local specialities, such as a glass of txakoli (local wine) and some pinxtos (tapas). My favourite haunt is Gandarias. Continue along to the Museo San Telmo, housed in a 16th century convent, the museum of Basque society and citizenship, whose newer extension hosts temporary exhibitions. It’s well worth stopping off in its delightful restaurant for coffee and cake or, at another time, lunch. Head back towards the Plaza de la Constitucion. At one end is the old city hall, in use until 1940, and one of the first buildings built after the 1813 fire. There are numbered apartments on three sides of the square from which people used to spectate dances and bullfights for free. The Old Town is a delight to wander around though many of its quaint old shops are (sadly) being replaced by high street names. On the far side of the Old Town, alongside Boulevard, you’ll find Le Brexta which plays host to one of San Sebastian’s two markets and, bizarrely, a McDonalds! Across the road you can see the Belle Epoque Victoria Eugenia Theatre, next to the swanky Marie Cristina Hotel, named after the queen consort of King Alfonso XII who was largely responsible for the town’s emergence as an upmarket holiday resort. The hotel has been a city landmark since the queen inaugurated it in 1912. Recently completely refurbished, the hotel just shouts glamour, opulence and elegance from its soaring ceilings, intricate mouldings, towering marble pillars to its polished grey and white marble floors. Well worth a visit, if only for a coffee. Cross over the Puente de Zurriola or Kursaal bridge to check out Gros and yet another of San Sebastian’s beaches, the Zurriola surf beach, which often features exhibitions along its boardwalk. Last year there were Henry Moore sculptures, this year there’s the exhibition of wildlife photographs which we saw last year in Gijon. At the far end of the beach is the Okendo Cultural Centre. 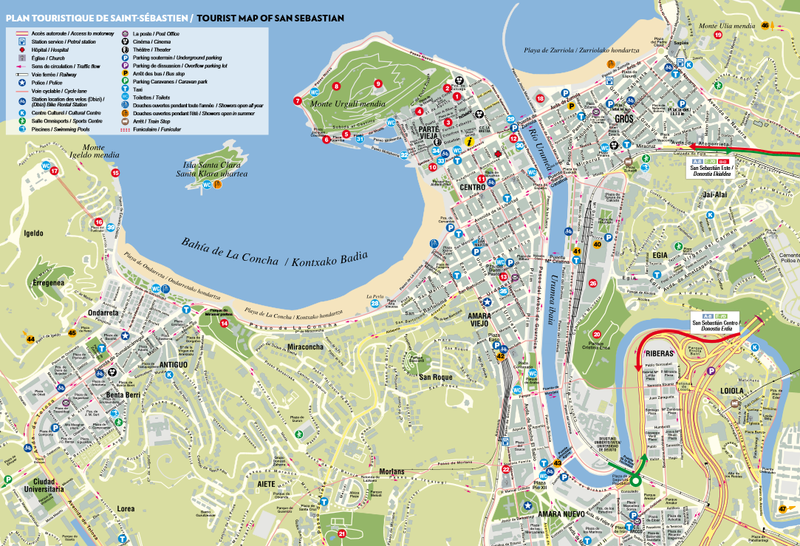 Alternatively, you can head along the river Urumea to the Parque Cristina Enea, probably the best of San Sebastian’s many green spaces, which is a real oasis, chock-full of exotic plants, next to the Tabakalera, a former tobacco factory now turned into a centre for contemporary culture. Our stroll has only touched upon a few of San Sebastian’s sights, there’s many more besides. One of my favourites is the Gipuzkoa Plaza, an English style park surrounded by arcades fashioned after those on the Rue de Rivoli in Paris and bounded on one side by a major bank with the most splendid wrought iron doors. Everywhere you look in San Sebastian there are delights to discover. But, don’t take my word for it, visit it yourself. Pleasure! As you’ve probably gathered, it’s one of my favourite places.